Buyers in record numbers are flooding into gun stores, retailers say. Ammo, too, is flying off the shelves. The reasons for the spike, last seen in 2009, include fears that a second Obama administration might restrict gun ownership and the popularity of TV shows devoted to doomsday preparation and killing zombies. Gun maker Sturm, Ruger says that in the first quarter it received orders for more than 1 million firearms--so many that it has now had to stop taking orders. Says a notice on its website: "Despite the company's continuing successful efforts to increase production rates, the incoming order rate exceeds our capacity to rapidly fulfill these orders. Consequently, the company has temporarily suspended the acceptance of new orders." It expects to resume accepting orders, it says, at the end of May. Other forces besides politics, though, explain the current boom. "There're the 'preppers," explains Parsons, "and then there's this whole Zombie Apocalypse thing." The first is a National Geographic TV show called "Doomsday Prepers" that chronicles the preparations being made by people convinced that a doomsday of some kind is coming. A whole industry has sprung up to sell preppers survival and self-dense goods, including guns and ammo. There are more than a dozen manufacturers, says Parsons, making zombie riffles, some with a picture of a zombie on them The two position on a zombie rifle's safety, instead of being marked "safe" and "fire," are labeled "dead" and "undead." 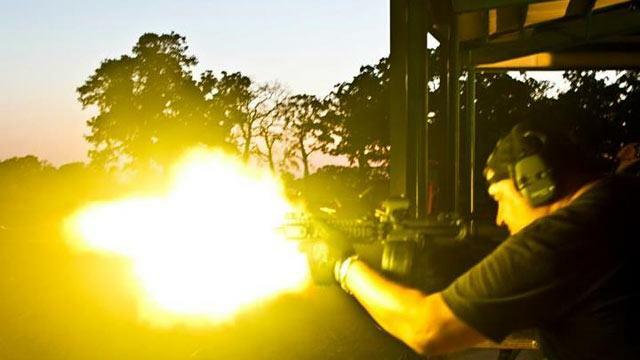 Gun maker DPMS Panther Arms is taking sign-ups now for its fifth annual zombie shoot, "Outbreak: Omega" set for June 23. "DPMS' Outbreak: Omega," says the company's website, "is the Original Zombie Shoot, and the largest. It is a non competitive 3-gun style fun shoot. All are invited to come and try your hand at killing Zombies. Tons of Prizes...followed by a HUGE after party!" Attendees don't actually shoot Zombies, which, last we heard, don't actually exist. They shoot targets that are zombie stand-ins.